Crawley () is a town and borough in West Sussex, England. It is 28 miles (45 km) south of Charing Cross (London), 18 miles (29 km) north of Brighton and Hove, and 32 miles (51 km) north-east of the county town of Chichester. Crawley covers an area of 17.36 square miles (44.96 km2) and had a population of 106,597 at the time of the 2011 Census. Gatwick Airport, nowadays one of Britain's busiest international airports, opened on the edge of the town in the 1940s, encouraging commercial and industrial growth. After the Second World War, the British Government planned to move large numbers of people and jobs out of London and into new towns around South East England. The New Towns Act 1946 designated Crawley as the site of one of these. A master plan was developed for the establishment of new residential, commercial, industrial and civic areas, and rapid development greatly increased the size and population of the town over a few decades. The town contains 13 residential neighbourhoods radiating out from the core of the old market town, and separated by main roads and railway lines. The nearby communities of Ifield, Pound Hill and Three Bridges were absorbed into the new town at various stages in its development. In 2009, expansion was being planned in the west and north-west of the town, in cooperation with Horsham District Council. Economically, the town has developed into the main centre of industry and employment between London and the south coast. Its large industrial area supports manufacturing and service companies, many of them connected with the airport. The commercial and retail sectors continue to expand. In the 5th century, Saxon settlers named the area Crow's Leah—meaning a crow-infested clearing, or Crow's Wood. This name evolved over time, and the present spelling appeared by the early 14th century. By this time, nearby settlements were more established: the Saxon church at Worth, for example, dates from between 950 and 1050 AD. Although Crawley itself is not mentioned in the Domesday Book of 1086, the nearby settlements of Ifield and Worth are recorded. The first written record of Crawley dates from 1202, when a licence was issued by King John for a weekly market on Wednesdays. Crawley grew slowly in importance over the next few centuries, but was boosted in the 18th century by the construction of the turnpike road between London and Brighton. When this was completed in 1770, travel between the newly fashionable seaside resort and London became safer and quicker, and Crawley (located approximately halfway between the two) prospered as a coaching halt. By 1839 it offered almost an hourly service to both destinations. The George, a timber-framed house dating from the 15th century, expanded to become a large coaching inn, taking over adjacent buildings. Eventually an annexe had to be built in the middle of the wide High Street; this survived until the 1930s. The original building has become the George Hotel, with conference facilities and 84 bedrooms; it retains many period features including an iron fireback. Crawley's oldest church is St John the Baptist's, between the High Street and the Broadway. It is said to have 13th-century origins, but there has been much rebuilding (especially in the 19th century) and the oldest part remaining is the south wall of the nave, which is believed to be 14th century. The church has a 15th-century tower (rebuilt in 1804) which originally contained four bells cast in 1724. Two were replaced by Thomas Lester of London in 1742; but in 1880 a new set of eight bells were cast and installed by the Croydon-based firm Gillett, Bland & Company. The Brighton Main Line was the first railway line to serve the Crawley area. A station was opened at Three Bridges (originally known as East Crawley) in the summer of 1841. Crawley railway station, at the southern end of the High Street, was built in 1848 when the Horsham branch was opened from Three Bridges to Horsham. A line was built eastwards from Three Bridges to East Grinstead in 1855. Three Bridges had become the hub of transport in the area by this stage: one-quarter of its population was employed in railway jobs by 1861 (mainly at the London, Brighton and South Coast Railway's railway works near the station). The Longley company—one of South East England's largest building firms in the late 19th century, responsible for buildings including Christ's Hospital school and the King Edward VII Sanatorium in Midhurst—moved to a site next to Crawley station in 1881. In 1898 more than 700 people were employed at the site. There was a major expansion in house building in the late 19th century. An area known as "New Town" (unrelated to the postwar developments) was created around the railway level crossing and down the Brighton Road; the West Green area, west of the High Street on the way to Ifield, was built up; and housing spread south of the Horsham line for the first time, into what is now Southgate. The population reached 4,433 in 1901, compared to 1,357 a century earlier. In 1891, a racecourse was opened on farmland at Gatwick. Built to replace a steeplechase course at Waddon near Croydon in Surrey, it was used for both steeplechase and flat racing, and held the Grand National during the years of the First World War. The course had its own railway station on the Brighton Main Line. In May 1946, the New Towns Act of 1946 identified Crawley as a suitable location for a New Town; but it was not officially designated as such until 9 January 1947. The 5,920 acres (2,396 ha) of land set aside for the new town were split across the county borders between East Sussex, West Sussex and Surrey. Architect Thomas Bennett was appointed chairman of Crawley Development Corporation. A court challenge to the designation order meant that plans were not officially confirmed until December 1947. By this time, an initial plan for the development of the area had been drawn up by Anthony Minoprio. This proposed filling in the gaps between the villages of Crawley, Ifield and Three Bridges. Bennett estimated that planning, designing and building the town, and increasing its population from the existing 9,500 to 40,000, would take 15 years. At first, little development took place in the town centre, and residents relied on the shops and services in the existing high street. The earliest progress was in West Green, where new residents moved in during the late 1940s. In 1950 the town was visited by the then heir to the throne, Princess Elizabeth, when she officially opened the Manor Royal industrial area. Building work continued throughout the 1950s in West Green, Northgate and Three Bridges, and later in Langley Green, Pound Hill and Ifield. In 1956, land at "Tilgate East" was allocated for housing use, eventually becoming the new neighbourhood of Furnace Green. Extended shopping facilities to the east of the existing high street were provided. The first stage to open was The Broadwalk in 1954, following by the opening of the Queen's Square development by Her Majesty The Queen in 1958. Crawley railway station was moved eastwards towards the new development. By April 1960, when Thomas Bennett made his last presentation as chairman of the Development Corporation, the town's population had reached 51,700; 2,289,000 square feet (212,700 m2) of factory and other industrial space had been provided; 21,800 people were employed, nearly 60% of whom worked in manufacturing industry; and only seventy people were registered as unemployed. The corporation had built 10,254 houses, and private builders provided around 1,500 more. Tenants were by then permitted to buy their houses, and 440 householders had chosen to do so by April 1960. In 1999, plans were announced to develop a 14th neighbourhood on land at Tinsley Green to the northeast of the town. However, these were halted when proposals for possible expansion at Gatwick Airport were announced. As of 2008, discussions were underway with Horsham District Council concerning the possible future provision of new housing on Crawley's western fringes, to be named Kilnwood Vale; much of the land proposed for development currently lies within Horsham's administrative boundaries. Development of the neighbourhood began in 2012. At (51.1092, −0.1872), Crawley is in the northeastern corner of West Sussex in South East England, 28 miles (45 km) south of London and 18 miles (29 km) north of Brighton and Hove. It is surrounded by smaller towns including Horley, Redhill, Reigate, Dorking, Horsham, Haywards Heath and East Grinstead. 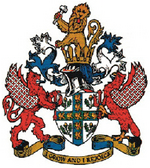 The borough of Crawley is bordered by the West Sussex local government areas of Mid Sussex and Horsham districts, and the Mole Valley and Tandridge districts and the Borough of Reigate and Banstead in the county of Surrey. 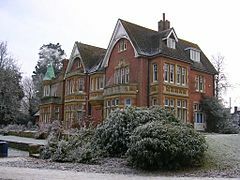 Crawley lies within the Sussex Weald, an area of highly variable terrain, so that many microclimates of frost hollows, sun traps and windswept hilltops will be encountered over a short distance. During calm, clear periods of weather this allows for some interesting temperature variations, although most of the time, when mobile westerly airstreams persist, the weather is typically Oceanic like the rest of the British Isles. Gatwick is the nearest weather station that publishes long-term averages that give an accurate description of the climate of the Crawley area, although more recently the Met Office has also published data for its nearby weather station at Charlwood. Both weather stations are about 3 miles north of Crawley town centre and at similar altitudes. Generally, Crawley's inland and southerly position within the UK means temperatures in summer are amongst the highest in the British Isles, Charlwood recording 36.3C (97.3F) and Gatwick recording 36.4C (97.5F) on 19 July 2006, just 0.2C and 0.1C lower, respectively, than the UK monthly record for that day set at Wisley, 20 miles to the west. The overall maximum stands at 36.5C (97.7F) at Charlwood, set on 10 August 2003. The absolute record for Gatwick is the aforementioned 36.4C. Before this, the highest temperature recorded at Gatwick was 35.6C (96.1F), also in August 2003. The maximum temperature was 25.1C (77.2F) or higher on 15.9 days of the year on average (1971-00) and the warmest day will typically rise to 29.4c (84.9f). Sunshine totals in Crawley are higher than many inland areas due to its southerly location: Gatwick averaged 1,574 hours per year over 1961–90. No data is available for 1971-00, but given increases at comparable sites nearby, annual averages are likely to be over 1,600 hours. Snowfall is often heavier in the Sussex Weald than in many other low-lying parts of central and southern England due to the proximity of moisture-laden southerly tracking low pressure systems bringing easterly winds and snow to areas from South London southwards. 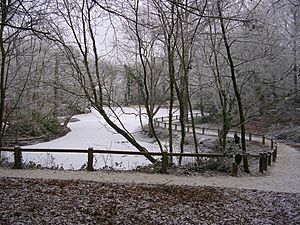 However, again due to the southerly location of the area, with warmer air from the nearby English Channel, the snow is often temporary as low pressure systems track north bringing in milder air; areas immediately north of London tend to have less accumulation, but lying for a longer duration. Rainfall is lower than the English average, but higher than many other areas of the South East. 1mm of rain or more falls on 116.7 days of the year. Each neighbourhood has colour-coded street name signs (Southgate example pictured). Church Road in Lowfield Heath village, looking east towards St Michael and All Angels Church. No houses remain here; a hotel, depots and light industrial units have replaced the earlier development. There are 13 residential neighbourhoods, each with a variety of housing types: terraced, semi-detached and detached houses, low-rise flats and bungalows. There are no residential tower blocks, apart from the 8 storey Milton Mount Flats at the North end of Pound Hill. Many houses have their own gardens and are set back from roads. The hub of each neighbourhood is a shopping parade, community centre and church, and each has a school and recreational open spaces as well. Crawley Development Corporation's intention was for neighbourhood shops to cater only to basic needs, and for the town centre to be used for most shopping requirements. The number of shop units provided in the neighbourhood parades reflected this: despite the master plan making provision for at least 20 shops in each neighbourhood, the number actually built ranged from 19 in the outlying Langley Green neighbourhood to just seven in West Green, close to the town centre. Each of the 13 residential neighbourhoods is identified by a colour, which is shown on street name signs in a standard format throughout the town: below the street name, the neighbourhood name is shown in white text on a coloured background. The Manor Royal industrial estate is in the north of the town. Although it is part of the Northgate ward, it is allocated a colour: its street name signs feature the word "Industrial" on a black background. Crawley's town centre is in the southernmost part of Northgate. Its street name signs do not follow the standard format of the neighbourhood signs, but display only the street name. Gatwick Airport was built on the site of a manor house, Gatwick Manor, close to the village of Lowfield Heath. Most of the village was demolished when the airport expanded, but the Grade II*-listed St Michael and All Angels Church, remains. The site of Lowfield Heath village, now occupied by warehouses and light industrial units, is on the airport's southern boundary, between the perimeter road and the A23 close to Manor Royal. Worth was originally a village with its own civil parish, lying just beyond the eastern edge of the Crawley urban area and borough boundary; but development of the Pound Hill and Maidenbower neighbourhoods has filled in the gaps, and the borough boundary has been extended to include the whole of the village. The civil parish of Worth remains, albeit reduced in size, as part of the Mid Sussex district. Tinsley Green, a hamlet in Worth parish, is now within the Pound Hill neighbourhood. Its houses, farms and public house, the Greyhound (at which the British and World Marbles Championship has been held annually since 1932), lie on or around an east–west minor road running from the main Balcombe–Horley road to the Manor Royal estate. The hamlet of Fernhill is 1 1⁄2 miles (2.4 km) east of Gatwick Airport and the same distance south of Horley. It has been wholly within the borough since 1990, when the borough and county boundary was moved eastwards to align exactly with the M23 motorway. Until then, its houses and farms straddled the boundary. Fernhill was the site of a fatal aeroplane crash in 1969: 50 people (including two residents) died when Ariana Afghan Airlines Flight 701 crashed into a house on Fernhill Road. The first house in the Forge Wood neighbourhood, pictured in September 2014 while under construction. Since the completion of Maidenbower, Crawley's thirteenth neighbourhood, two other sites in the borough have been considered as potential sites for new residential areas. A proposal to build a neighbourhood in the Tinsley Green area was first made in January 1998, and in December 2009 the Government allowed an appeal to be heard against the latest refusal of planning permission. A new planning application was registered in July 2012, and in November of that year details of the proposals were published. Forge Wood is intended to have 1,900 houses, commercial and industrial buildings, a shopping area, a community centre and hall, a primary school and areas of "recreational open space". Pegasus Planning Group Ltd presented the application on behalf of housebuilders Persimmon Homes and Taylor Wimpey. The application proposes 5,000 square metres (54,000 sq ft) of commercial and industrial floorspace and 2,500 square metres (27,000 sq ft) of floorspace for retail use as well as the housing. It was reported in 2012, before it was approved, that the four-phase "North East Sector" development was expected to start in 2013 and last for 12 years. The name Forge Wood was decided upon in December 2013. Work on the first phase was scheduled to start in 2014, and the first houses are due to be completed by the end of that year. Meanwhile, Crawley Borough Council began discussions with neighbouring Horsham District Council in 2006 in connection with a proposed neighbourhood west of Bewbush; such development would straddle the boundary of the two local authorities. Planning permission was granted in March 2011, the name Kilnwood Vale was adopted, and in October 2011 Crawley Borough Council sold for £3 million some areas of land required for the construction of access roads. Work on the five-phase scheme started in October 2012. Up to 2,500 houses, a school, library, supermarket and other facilities will be provided. 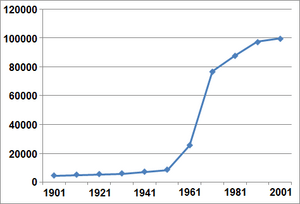 Graph of population growth in Crawley 1901–2001. Horizontal axis: year. Vertical axis: population. At the census in 2011 the population of Crawley was recorded as 106,597. The 2001 census data showed that population then accounted for 13.2% of the population of the county of West Sussex. The growth in population of the new town—around 1,000% between 1951 and 2001—has outstripped that of most similar-sized settlements. For example, in the same period, the population of the neighbouring district of Horsham grew by just 99%. Approximately 64.5% of the population is aged below 45, compared to 55% of the population of West Sussex. White British account for 84.5% of the population and 15.5% of people are from other ethnic backgrounds. People of Indian and Pakistani origin account for 4.5% and 3% of the population respectively. Many inhabitants of Crawley work locally at Gatwick Airport as either air or ground crew. Many Chagossians expelled from the Chagos Archipelago in the Indian Ocean settled in Crawley in the 1960s and 1970s, and it was reported in 2016 that the town's Chagossian community numbered approximately 3,000 people. 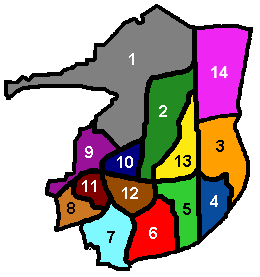 The borough has a population density of around 22 persons per hectare (9 persons per acre), making it the second most densely populated district in West Sussex, after Worthing. The social mix is similar to the national norm: around 50% are in the ABC1 social category, although this varies by ward, with just 44% in Broadfield North compared to 75% in Maidenbower. The proportion of people in the borough with higher education qualifications is lower than the national average. Around 14% have a qualification at level 4 or above, compared to 20% nationally. Crawley's early development as a market town was helped by its location on the London–Brighton turnpike. The area was joined to the railway network in the mid-19th century; and since the creation of the new town, there have been major road upgrades (including a motorway link), a guided bus transit system and the establishment of an airport which has become one of Britain's largest and busiest. The London–Brighton turnpike ran through the centre of Crawley, forming the High Street and Station Road. When Britain's major roads were classified by the British government's Ministry of Transport between 1919 and 1923, it was given the number A23. It was bypassed by a new dual carriageway in 1938 (which forms the A23's current route through the town), and then later to the east side of the town by the M23 motorway, which was opened in 1975. This connects London's orbital motorway, the M25, to the A23 at Pease Pottage, at the southern edge of Crawley's built-up area. The original single-carriageway A23 became the A2219. The urban area of Crawley is served by a total of three rail stations including Ifield railway station. Due to Crawley's expansion this station is now surrounded by the town's western areas. Opened as Lyons Crossing Halt on 1 June 1907 to serve the village of Ifield, it was soon renamed Ifield Halt, dropping the "Halt" suffix in 1930. Regular train services run from Crawley, and also Ifield, to London Victoria and London Bridge stations, Gatwick Airport, East Croydon, Horsham, Bognor Regis, Chichester, Portsmouth and Southampton. Three Bridges has direct "Thameslink" trains to Bedford & Brighton. Crawley was one of several towns where the boundaries of Southdown Motor Services and London Transport bus services met. In 1958 the companies reached an agreement which allowed them both to provide services in all parts of the town. When the National Bus Company was formed in 1969, its London Country Bus Services subsidiary took responsibility for many routes, including Green Line Coaches cross-London services which operated to distant destinations such as Watford, Luton and Amersham. A coach station was opened by Southdown in 1931 on the A23 at County Oak, near Lowfield Heath: it was a regular stopping point for express coaches between London and towns on the Sussex coast. This traffic started to serve Gatwick when the airport began to grow, however. When the National Bus Company was broken up, local services were provided by the new South West division of London Country Bus Services, which later became part of the Arriva group. Metrobus acquired these routes from Arriva in March 2001, and is now Crawley's main operator. It provides local services between the neighbourhoods and town centre, and longer-distance routes to Horsham, Redhill, Tunbridge Wells, Worthing and Brighton. In September 2003 a guided bus service, Fastway, began operating between Bewbush and Gatwick Airport. A second route, from Broadfield to the Langshott area of Horley, north of Gatwick Airport, was added on 27 August 2005. Gatwick is the world's busiest single-runway international airport. Gatwick Airport was licensed as a private airfield in August 1930. It was used during the Second World War as an RAF base, and returned to civil use in 1946. There were proposals to close the airport in the late 1940s, but in 1950 the government announced that it was to be developed as London's second airport. It was closed between 1956 and 1958 for rebuilding. Her Majesty The Queen reopened it on 9 June 1958. A second terminal, the North Terminal, was built in 1988. An agreement exists between BAA and West Sussex County Council preventing the building of a second runway before 2019. Nevertheless, consultations were launched in 2002 by the Department for Transport, at which proposals for additional facilities and runways were considered. It was agreed that there would be no further expansion at Gatwick unless it became impossible to meet growth targets at London Heathrow Airport within existing pollution limits. The new town's original leisure centre was in Haslett Avenue in the Three Bridges neighbourhood. Building work started in the early 1960s, and a large swimming pool opened in 1964. The site was extended to include an athletics arena by 1967, and an additional large sports hall was opened by the town mayor, Councillor Ben Clay and Prime Minister Harold Wilson in 1974. However, the facilities became insufficient for the growing town, even though an annexe was opened in Bewbush in 1984. Athlete Zola Budd had been asked to take part in a 1,500-metre race as part of the opening celebrations, but her invitation was withdrawn at short notice because of concerns raised by council members about possible "political connotations and anti-apartheid demonstrators". In 2005, Crawley Leisure Centre was closed and replaced by a new facility, the K2 Leisure Centre, on the campus of Thomas Bennett Community College near the Broadfield Stadium. Opened to the public on 14 November 2005, and officially by Lord Coe on 24 January 2006, the centre includes the only Olympic-sized swimming pool in South East England. In March 2008 the centre was named as a training site for the 2012 Olympics in London. Crawley Development Corporation made little provision for the arts in the plans for the new town, and a proposed arts venue in the town centre was never built. Neighbourhood community centres and the Tilgate Forest Recreational Centre were used for some cultural activities, but it was not until 1988 that the town had a dedicated theatre and arts venue, at the Hawth Theatre. (The name derives from a local corruption of the word "heath", which came to refer specifically to the expanse of wooded land, south of the town centre, in which the theatre was built.) Crawley's earliest cinema, the Imperial Picture House on Brighton Road, lasted from 1909 until the 1940s; the Embassy Cinema on the High Street (opened in 1938) replaced it. A large Cineworld cinema has since opened in the Crawley Leisure Park, which itself also includes ten-pin bowling, various restaurants and bars and a fitness centre. The Liquid nightclub on Station Way can accommodate 1,900 people. Each neighbourhood has self-contained recreational areas, and there are other larger parks throughout the town. The Memorial Gardens, on the eastern side of Queen's Square, feature art displays, children's play areas and lawns, and a plaque commemorating those who died in two Second World War bombing incidents in 1943 and 1944. Goffs Park in Southgate covers 50 acres (20 ha), and has lakes, boating ponds, a model railway and many other features. Tilgate Park and Nature Centre has walled gardens, lakes, large areas of woodland with footpaths and bridleways, a golfing area and a collection of animals and birds. Crawley has three Grade I listed buildings (the parish church of St Margaret in Ifield, the parish church of St Nicholas, Worth, and the Friends Meeting House in Langley Lane, Ifield), 12 Grade II* listed buildings and 85 Grade II listed buildings. The borough council has also awarded locally listed building status to 58 buildings. Virgin Atlantic Airways head office. 34 and 36 High Street - Grade II late 18th-century brick building with sash windows, two chimneys and a tiled roof. Crawley Facts for Kids. Kiddle Encyclopedia.